The Ishikawa prefecture is facing the Japan Sea. 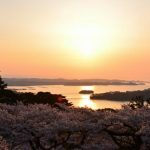 Kanazawa is the biggest city in the Ishikawa prefecture and has plenty of attractive monuments and places, starting with the Kanazawa Castle which has the beautiful cherry blossoms scenery. However, Kanazawa presents the fresh products from the Japan Sea as its strength! 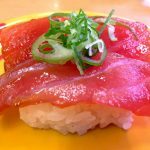 I’m introducing the 10 carefully selected sushi restaurants in Kanazawa. When you want to eat the products from the sea, sushi is the best! Please visit them! Kanazawa reminds us of the fresh fish and shellfish. So, if you eat sushi there, you want to eat an orthodox one, don’t you? 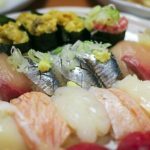 I’m introducing the [Morimori-sushi] Kanazawa Ekimae-ten which is just a short walking distance from the Kanazawa station on the Hokutetsu-line. This restaurant is a sushi-go-round one, but the ingredients are very fresh and delicious. They have kohada (gizzard shad), hatahata (sand fish), maiwashi (sardine pilchard), maaji (horse mackerel) and masaba (chub mackerel) and prepared various toppings such as mackerel, tuna, swordfish, crab and prawn. As it is an ultra popular shop, please visit there being ready to join a queue! Please enjoy the fresh products from the sea in Kanazawa. The [Kanazawa Maimon-sushi] which is a 12km walk from the JR Nonoichi station. They buy the fresh ingredients for topping surprisingly twice a day. 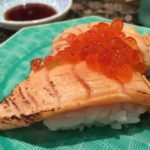 As they are so conscious about the freshness of toppings you can enjoy the sushi no matter with whom you visit there, with your family or on your date. The shop opened in 1999 and since then it has been keeping its popularity, for 16 years. Their tasteful products are guaranteed. You can order the lunch menu-set for ¥1,000 and because of its value for money, it has been loved by the locals. A first-class topping only costs ¥300. Would you like to enjoy them? I wonder that there may be many people who like to enjoy sushi at the non-go-round counter in a relaxed manner. For such people, I’d like to recommend the [Sushidokoro Aiji] which is a 5-minute-walk from the bus-stop, Katamachi Chuodori. As it is less than 1km from the Nomachi station, it is possible to go there by train and then walk. The sushi course which contains 12 different kinds of toppings costs ¥6,000. Although a booking in advance is required, the lunch course costs ¥4,000. Even the authentic chef’s choice course costs ¥8,000, which is very reasonable. Why don’t you enjoy the delicious sushi, taking your time? This [Sushi Kuinee!] is also a sushi-go-round restaurant, but they are not made by machine, a chef carefully makes them one by one. They buy the ingredients from the Hiki fishing port and the Kanazawa port, so their freshness is guaranteed! 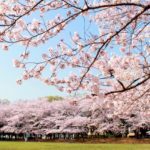 It is located in the area which is 10-minute-walk from the Kanazawa station and is about 2km from the Isobe station. It is a possible distance to get there on foot, but I recommend that you should use a car or a taxi. The set contains at least 3 pieces of sushi and costs ¥460 which is reasonable. I really would like you to taste their fresh fish as well as shellfish. 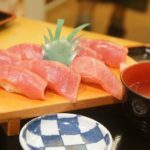 The [Sushidokoro Megumi] is recommended for the true sushi fans who want to concentrate on the flavour of sushi toppings in the quiet atmosphere. You can get there in 25 minutes from the east-exit at the Kanazawa station by taxi. It has reservation only system and you can reserve a seat even 3 months ahead by telephone during non-working time. As it is a popular restaurant, an early booking is recommended. Their menus are all the chef’s choice served with confidence! Although the prices are the original proper ones, 15 pieces of nigiri (hand formed sushi) cost ¥18,000 and 10 pieces of nigiri with some nibbles are ¥25,000, it is worth visiting. Please enjoy the excellent sushi in Kanazawa until you are completely satisfied. The [Yamasan-sushi] is an original sushi restaurant which is a 15-minute-walk from the Kanazawa station. Their nigiri (hand formed sushi) is superb, but the recommended one is the Kaisen-don (¥2,700)! It is one of the [Yamasan-sushi]’s flagship menus. There may be people who think, “One Kaisen-don costs ¥2,700? !”, but it is worth it for value. Their Kaisen-don has the gold-leaf scattered on the top of it. It has a gorgeous look at sight, so it looks impressive on SNS (Social Networking Service). There are other donburi dishes such as the Ikura-don (rice bowl topped with salmon roe), Uni-ikura-don (with sea-urchin and salmon roe), Tekka-don (with sliced raw tuna) and Omakase-don (with the chef’s choice). As they will close their shop as soon as they run out the ingredients, an early arrival is recommended. The [Sushidokoro Asanogawa] which is close to the Hokutetsu-bus-stop, Hashibacho is also recommended. It is a small detached house restaurant which has been standing near to the river Asano. They buy all the ingredients for topping on the day every day. So, the freshness and flavour can’t go wrong. The menus are all sushi-sets. The set of a Kobachi (small bowl), Shinogi (control), Sushijukkan (10 pieces of sushi), Temaki (rolled sushi) and Shiru (soup)is (¥8,000). 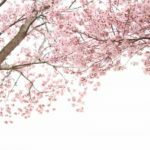 The Sushiori (sushi in a wooden box) consists of Ume (plum) (8 pieces of sushi ¥8,000), Take (bamboo) (10 pieces of sushi ¥5,000) and Matsu (pine tree) (12 pieces of sushi ¥6,000). Especially, Mr. Morita who used to work for the popular sushi restaurant, Komatsu Yasuke as a chief chef’s directly handed down, the “marinated red tune” and it is exquisite! Please try and taste it! 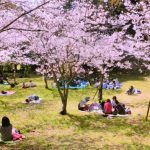 The [Gyogyomaru] is a 3-minute-walk from the Kanazawa station and you can drop in at the shop casually on the way back from shopping or shightseeing. The [Gyogyo-nigiri] has 6 pieces of nigiri for ¥980 which is good value for money! As it is a tavern, it is attractive since various other menus have been prepared. The first-class-nigiri is ¥180 per piece, today’s shabushabu is ¥1,180, firefly squid mixed with squid ink is ¥480, seafood-yukhoe-natto (fermented soy-beans) is ¥680, toasted ray fin is ¥480 and today’s Gyogyo-salad is ¥680. Most menus are fish related ones, so you can enjoy the meal which only Kanazawa can offer. 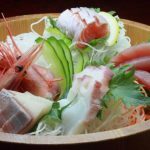 It is nice to enjoy sushi in a sophisticated atmosphere, but this [Kawabata Sengyo-ten] is recommended for people who want to enjoy sushi in an exciting and lively place. The inside of the shop is just like a lively fish market. You may become happy just by being there. The sushi menu has the chef’s assorted nigiri choice and the nigiris with various toppings such as prawn, blue-coloured fish and shellfish. They will close the shop when all fish have gone, so please be aware of it! The Japanese sake and shochu which go well with the sushi have been prepared for the reasonable prices. This shop is suitable for people who want to drink alcoholic drinks as well. Please visit there! The [Kikuya] which is a 1km from the Noda station is a small sushi shop with only 6 counter seats. You can sit closely to the chief chef, so you can watch him making your ordered sushi into shape in front of you. As it is a small relaxed shop, you can enjoy yourself on your own, with your friend or on your date! This shop will be also closed when the ingredients have all sold out, so please be careful about the time of your arrival. Please enjoy the sushi, using plenty of products from the sea which are made one by one with care, until the last bite! Let’s enjoy the fresh products from the sea in Kanazawa, especially the sushi! 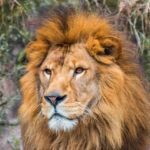 What is your impression about this article? 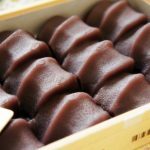 I’ve introduced the 10 recommended sushi shops which I’d like you to visit when you go to Kanazawa. As all the recommended shops are famous locally, with the reputation of deliciousness, you may be confused which shop you should visit. 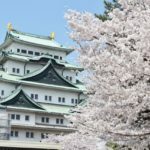 Why don’t you go to Kanazawa which has become easier to get to because of the opening of the Bullet-train-line on holiday? Of course please visit the sightseeing spots as well.